1856 Colton Plan or Map of Washington D.C.
Georgetown and The City of Washington The Capital of The United States of America. 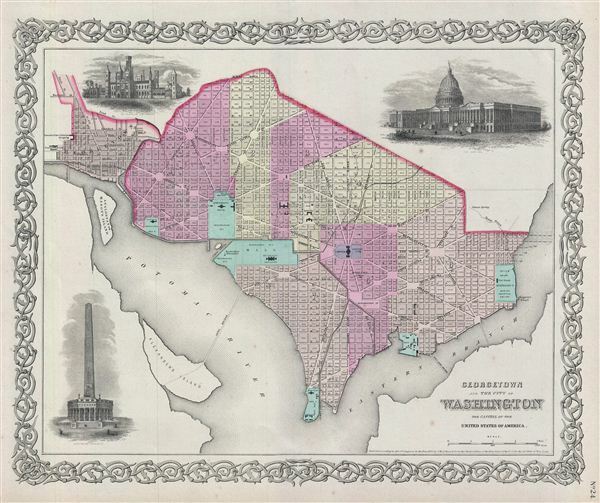 A beautiful 1855 first edition example of Colton's map of Washington D.C. and Georgetown. Like most of Colton's state maps, this map was derived from an earlier wall map of North America produced by Colton and D. Griffing Johnson. Covers the city in incredible detain from Georgetown (Georgetown University, then college shown) in the upper left quadrant to Alexander's Island in the south and as far east as Magazine Warf. The map is a lithographic engraving covering the nation's capital shortly before the outbreak of the American Civil War. Notes numerous important buildings including the Capitol, the Smithsonian Institution, the White House (not yet called the White House), the Washington Monument, the National Observatory, the Navel Yard, the Poor House, the Arsenal, Penitentiary and others. The city's famous grid and ray structure appear according to L'enfant's brilliant plan. Georgetown appears as a separate entity in the upper left corner with Georgetown College noted just outside the city border. Also shown are proposed landfills and extensions to the east side of the city into the east branch of the Potomac River. The map also contains illustrated views of The Smithsonian Institute, Washington Monument and the Capitol Building. The second dome of the Capitol Building (the first was a smaller, green copper dome) is shown complete in the upper right hand quadrant of this map, though in fact it was only partially built when this map was issued. Surrounded by Colton's typical spiral motif border. Dated and copyrighted to J. H. Colton, 1855. Published from Colton's 172 William Street Office in New York City. Issued as page no. 24 in volume 1 of Colton's 1856 Atlas of the World.